...just a little something....: Introducing Die-namics from MFT! Are you ready for the fun announcement from MFT? We've all been holding a big secret, and having a blast playing with some our new goodies. Introducing Die-namics from MFT - you may have even seen samples from customers who received one as part of this month's VIP Kit! Die-namics are the brand new offering that we've been taunting the junkies with... exclusive, quality American Steel dies, and let me say, I'm loving playing with them! I have a few projects to share with you today, and I also put together a little demonstration video so you can see how they work! I'm sure you will see MANY previews from the girls on the team today. Be sure to check Kim's blog for a full link after 11 am today! For those of you that are a more visual learner, I've done a quick product video showing what they look like, and some tips and tricks on how to work with them! This month, there are three shapes for sale. The first one I worked with was the scallop, and I love that it is a wide, oval shaped scallop. You'll just love the variety of materials that you can add to your projects with Die-namics. For my first sample, I reached for the cork that I picked up just last week. You'll be thrilled to know that Kim will now be carrying it so that you can add this new hot trendy item to your projects! Hooray! I also gave this same die a quick run with some fabric scrap that I have leftover from a sewing project. What an easy way to use up those too cute to toss scraps. 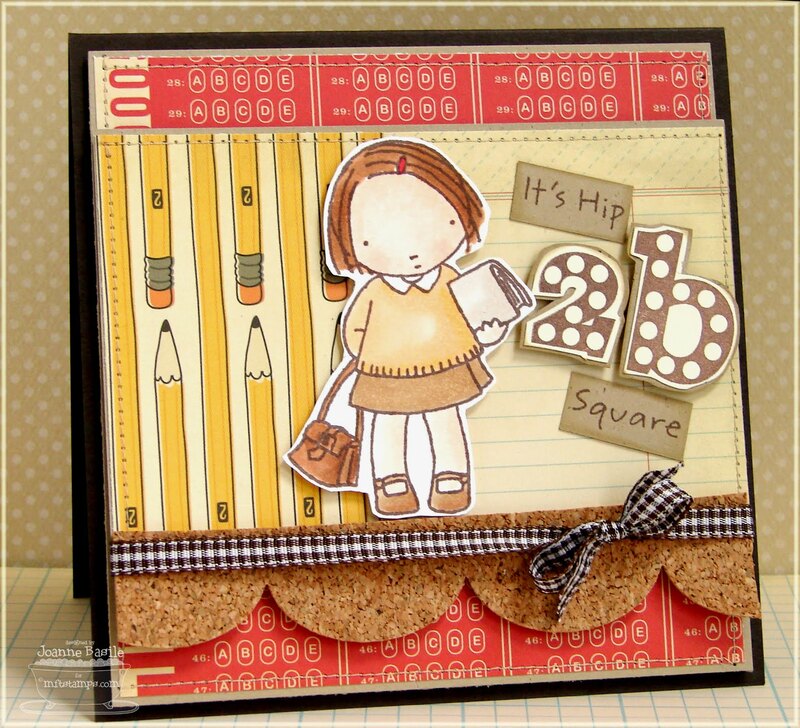 Love the handmade charm of adding fabric to a papercrafting project! Using that same stack, I ran through several scraps of fabric that I've had kicking around for another project. 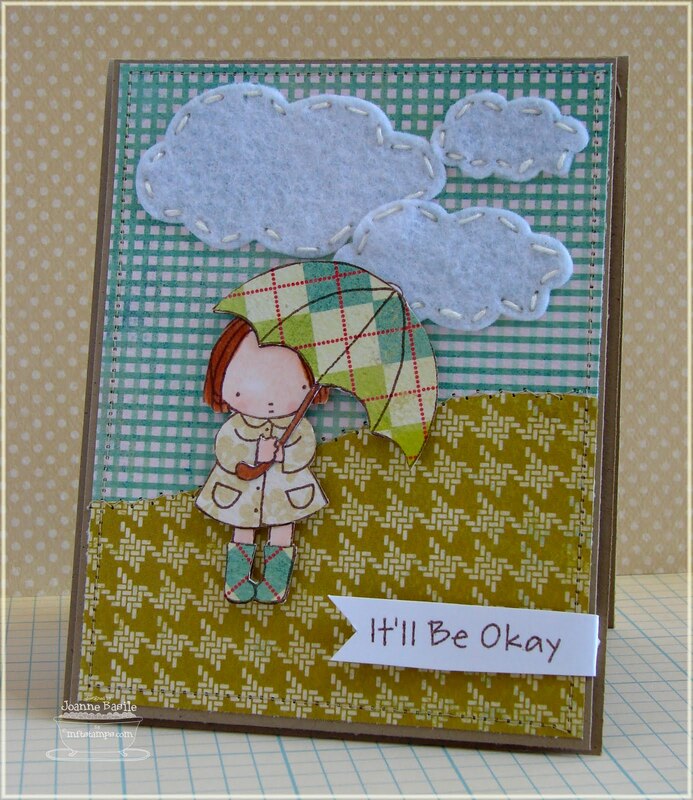 I used the same die, but this material gives such a soft and serene effect. I diecut six pieces of fabric, for a total of six rows of scallops. I laid the layers out, alternating between the two patterns, and affixed the layers with a quick bit of scotch tape to anchor them in place... then quickly zipped it through my sewing machine. Quick Tip: When using fabric, I recommend running your Die-namic die through your machine twice. This is just to ensure you get a fully clean cut. If you happen to have any individual threads still attached when you go to remove the die, be sure to cut them with scissors, don't pull or you'll put a big, yucky pull through your fabric. Up next, I couldn't resist these sweet clouds, so I had to put them to work right away! I chose some snow white felt for some puffy clouds. I love that they come in a three pack, because really, you should use embellishments in odd increments. And, being fused together is perfect because you won't loose any of the pieces! If you're ready for even MORE previews of MFT Die-namics, be sure to check over at the MFT Blog today after 11am, also, you'll want to check out this gallery on Splitcoast. Previews for the upcoming stamp release begin tomorrow! OMG!OMG! OMG!!!! I'm jumping up and down, this is the best news ever!!!! 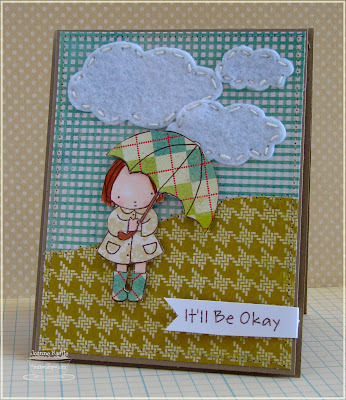 I'm in looooove with the cloud die, I sure hope Kim has a lot on hand-these are going to be HOT! thanks for the tutorial. love your projects, Joanne! Wow...these are all SO gorgeous! I love how you used the dies and your layout on the first card with the PI girl cut out on only one side is so original!!! Awesome video Joanne!! Love them - definitely must haves! So sneaky with that third peek too! Great ideas, video and PROJECTS!!! Fantastic Jo!!! Really! Love each of your projects, Joanne!! Clouds!!! YIPEE!!! Cork!!!! YIPPEE!!! Joanne, You do beautiful work! The video is great thanks so much for sharing! I love that multilayered scallop card! and a film maker too! J, you are rockin' these dies! You know I love that cork, but the fabric and stitched cloud--wow! Love it, Love it ... Gotta have it!! I've been waiting for WEEKS for a similar die to the large scallope to come 'back in stock' from another on-line company with no luck. I hope to be among the first to order mine from MFT!! Enjoying your GDT with us this week at The Shabby Tea Room too!! Love the cork paper! Love the layered scallops! Lovin' those clouds! okay... lovin' these dies!! Love how much you play with different products! That cork is my favorite with the school theme! Love your samples. It shows how you can use the dies on different materials. Great video too. Joanne! You are amazing! All your samples ROCK! Love, love, love these! 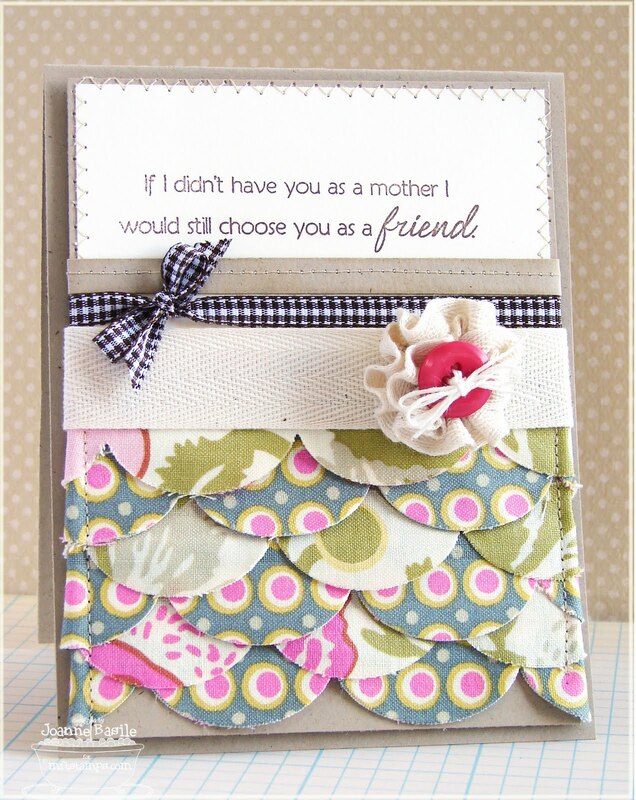 Esp lovin' the fabric scalloped mom card! Fun samples! Cork, fabric, AND stitched felt. Get outta here, GF! These are incredible. Thanks for the bucket loads of gorgeous inspiration! Thanks for the tips Joanne your samples are FAB!! Thanks for the video tutorial! All of your projects are adorable! I really love the idea of die cutting denim! LOVE,LOVE,LOVE all your cards! Those dies are awesome!! Your samples are totally darling! I just love that cork--such a cool detail! Your video is super GREAT too!! so awesome! thank you for the video- i now must scour dd closet for clothes that don't fit her- LOL! your cards are gorgeous & i can't wait to have the other dies too!! I love ALL of your cards! They are just precious! I love the layered scallops! SO cool. Love the layered scallops, super cute and I was so surprised that you could use fabric!! Very cool! LOVEEE your cards! 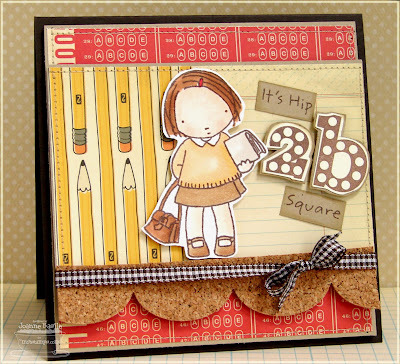 Thanks for sharing how they look on all different textures and mediums...fun dies! Gorgeous cards, Joanne and the video is awesome!!! Great job! Wonderful cards Joanne. Love the stitching on the card! Gorgeous cards! Love the first especially with the cork! Speechless....look at those cards! Girl, you rock! And now I can picture you talking to me after watching the video, well done with that! I use Painter's Tape to hold dies in place. It's reusable, does no harm to DP, and when done, I stick it to my Big Shot handle for the next time. Great tutorials for the new dies. Awesome cards, Joanne! The first is too adorable with the pencil dp and cork. Love the sentiment treatment! The second one is gorgeous! Love all those ruffles! And the stitched felt clouds on the last one are FAB! Wow Joanne!! What amazing work!! All three are STUNNING!!!! Holy Cow! Every one of these cards is fabulous! and all so different!